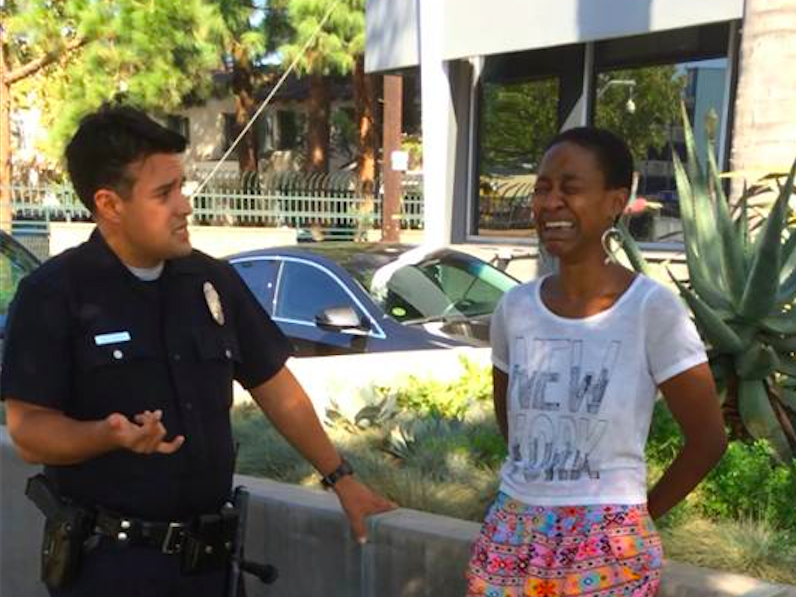 Django Unchained actress Daniele Watts’ partner, Brian Lucas, has taken to social media to criticize what LAPD Sgt. Jim Parker said when he briefly detained Watts following a 911 call about alleged indecent exposure. However, much of what Lucas claims appears to be contradicted by the actual audio recording of the incident. Watts was detained for refusing to show her ID to Sgt. Parker when he arrived to investigate reports by nearby witnesses who complained of “lewd acts” (and suggestions of sexual activity) that were taking place in a vehicle that was parked outside of the Director’s Guild in Studio City. If you listen closely to the TMZ audio, you can tell that he’s comfortable around me (because he thinks I’m on his side), which exposes several comments that display his abuse of power: “she needs to learn that she doesn’t dictate what happens,” …”She’s just trying to get at me” “She’ll learn her lesson” etc etc. “Keep yelling. That really helps,” Sgt. Parker responded. Again, Breitbart News heard no mention of said exchange between Sgt. Parker and Lucas. What was heard (with great difficulty due to Watts being so outspoken on the audio tape) was Lucas telling Sgt. Parker that “it happened like a day ago” that Lucas and Watts were at a relative’s home in Loma Linda (as he states in his open letter) when “someone said there’s a black and white couple…”.